Dr. Wyche’s Yellow – Tomato Town organically grows heirloom tomatoes in the greater Kansas City area as well as Johnson County, Leawood, Lenexa, Olathe, Shawnee, Merriam KS, Independence MO and Kansas City Missouri, KCMO. Varieties include: Cherokee Purple, Brandywine, Stupice, Carbon, Black Krim, Black Cherry, Yellow Pear, Absinthe and Aunt Ruby’s German Green. The late Dr. John Wyche owned the Cole Brothers Circus and used elephant manure to fertilize his heritage gardens. While we are doubtful that animal size effects the quality of the manure, the fruit this plant produces are majestic. 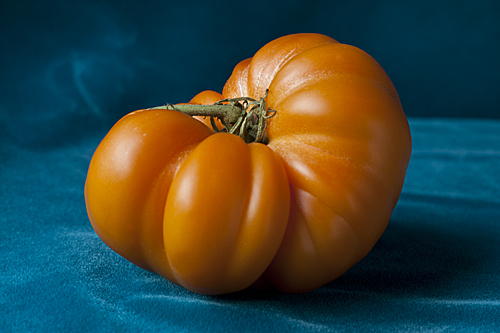 This sweet-tasting, orange-fleshed specimen weighs in at one pound and has an excellent flavor. This entry was posted on Friday, August 5th, 2011 at 7:18 am. It is filed under Varieties. You can follow any responses to this entry through the RSS 2.0 feed.